The White House "has made a deal" with the Turkish government to release U.S. pastor Andrew Brunson soon, NBC news reported Thursday, citing U.S. officials. NBC said the White House expects Brunson to be released and returned to the U.S. "in coming days," citing two senior Trump administration officials and one another source briefed on the matter. The sources said the charges against Brunson are expected to be dropped at his next court hearing, scheduled for Friday. The details of the agreement remain unclear, but sources said the U.S. committed to easing the economic war it has waged on Turkey over the terror-linked pastor's detention. The senior administration officials said the White House had not been notified of any change in Friday's hearing date. The State Department, commenting on the report, said Thursday it was unaware of any deal with the Turkish government for Brunson's release. Vice President Mike Pence, speaking at a briefing, declined to confirm any deal but voiced hopes for the pastor's release through the court proceedings Friday. 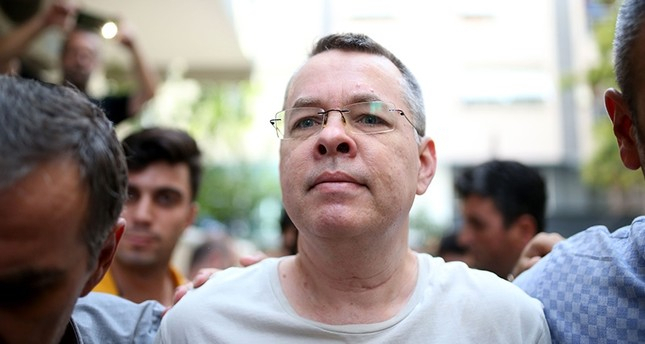 Ankara has insisted that Brunson's case remain an independent matter for the judiciary, and has resisted U.S. pressure to release the terror-linked pastor. President Recep Tayyip Erdoğan on Wednesday commented on Brunson's upcoming hearing, saying the process was a judicial case and that he has no power as a president to intervene in the judiciary. "I am not in a position to intervene in the judicial process as Turkey is a country of rule of law. I am the president of the Republic of Turkey, which is a democratic republic. I have to abide by whatever the courts decide," he said. Erdoğan added that those related to the Brunson case also need to abide by the rules of law and the courts' decisions. Brunson, an evangelical pastor at the Evangelic Resurrection Church in the western city of Izmir for the past 20 years, was arrested in Turkey in September 2016 for alleged links to the PKK terrorist group and Gülenist Terror Group (FETÖ), who orchestrated an attempted coup on July 15, 2016. The pastor faces 35 years in jail on charges of espionage and committing crimes on behalf of FETÖ and the PKK. He was moved to house arrest on July 25 due to health problems.